My cat is a little thief. Every blanket I make she thinks is hers. I had a bag of mill ends from Spotlight and thought I’d make a corner to corner baby blanket to add to my Etsy store (which i desperately need to re open) So as i’m crocheting away cat comes over to investigate. I tell her to go away and she does. But next morning I find her sleeping on the blanket. She dragged it from the lounge to her sleeping space! It’s no good to sell now so I let her use it. However, it’s not finished! She won’t let me finish it! Finally I manage to distract her and finish it off for her. She loves it. It’s really thick so maybe it’s the texture, anyway it’s very well used. Over the weekend I managed to steal it back so I could wash it cause it stunk! It took two days of soaking and drying for it to be useable now. This cat better not steal another blanket. A circle pattern is super handy to have! 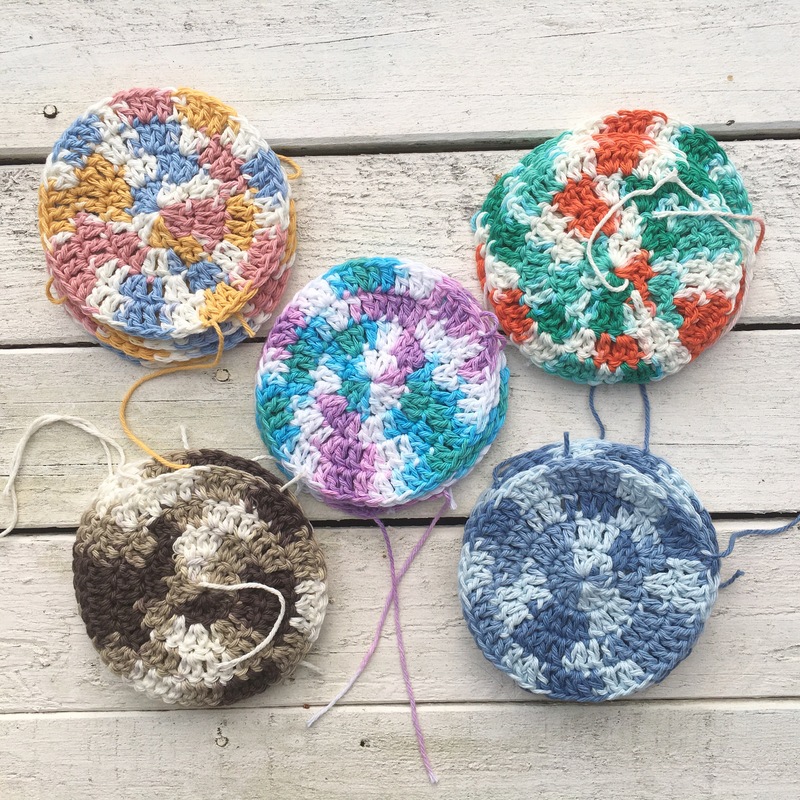 You can make coasters, blankets, placemats, and design motifs simply but adding more rows. I’m sure i’m not the first person to come up with this pattern, but it’s the one I use to make all my circle things. CH 3, 2 DC into the next stitch, *DC into the next stitch, then 2 DC into the next. Repeat from * all the way around. SL ST to the top of the Beg Ch 3. Ch 3, 1 DC into the next stitch, 2 DC into the next. *1 DC into the next two stitches, 2 DC into the next stitch. Repeat from * all the way around. SL ST to the top of the Beg Ch 3. Ch 3, 1 DC into the next stitch, 2 DC into the next. *1 DC into the next three stitches, 2 DC into the next stitch. Repeat from * all the way around. SL ST to the top of the Beg Ch 3. Ch 3, 1 DC into the next stitch, 2 DC into the next. *1 DC into the next four stitches, 2 DC into the next stitch. Repeat from * all the way around. SL ST to the top of the Beg Ch 3. If you want to make a blanket but don’t want it to be very thick and chunky I recommend this zig zag blanket. It’s really simple to do once you’ve gotten past the first two row. This blanket is ideal for a couch blanket or a kids blanket. I’m not sure how it would go as a baby blanket as there are quite a few holes that might get tangled with little baby fingers. 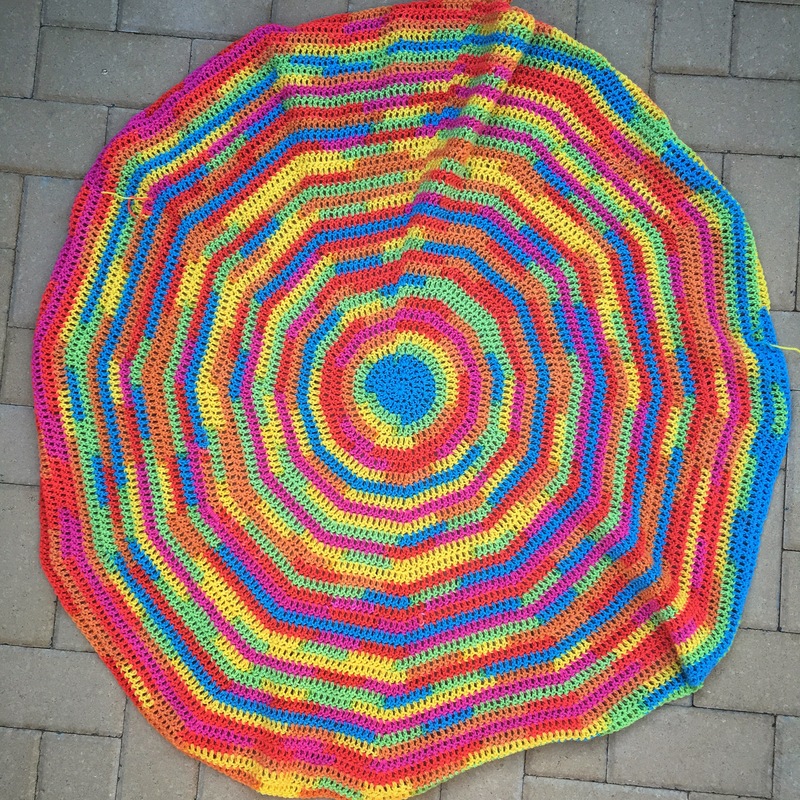 I had come across some delicious rainbow gradient yarn so I was looking to make a blanket that would show off the colours without having a fussy pattern. To start I chained 250. This is totally up to you, but just make sure you do an even number plus 1 to turn. 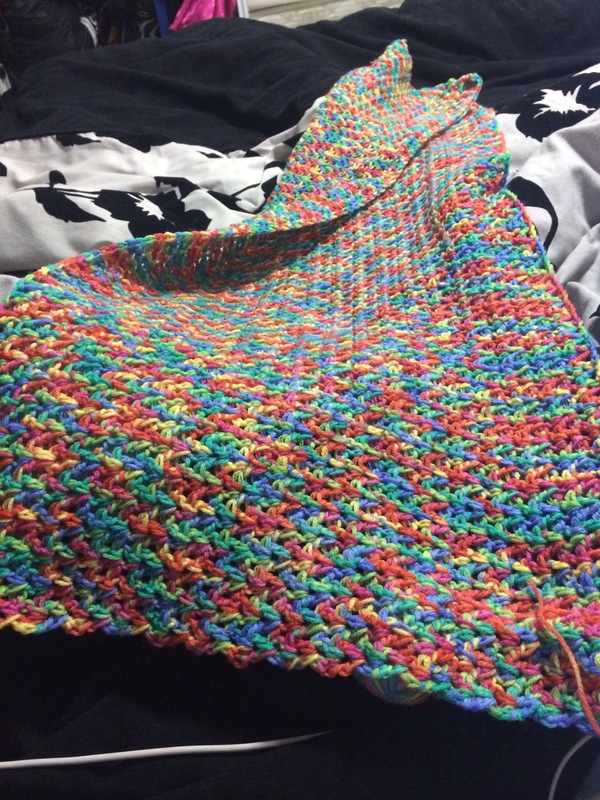 I used a size 6mm hook which is the perfect tension with the 8py yarn I chose. Once you’ve chained these turn your work over. Yarn over and insert hook into the second chain, draw a loop and pull through two, yarn over and pull though the final two loops. Repeat this stitch into the same hole. Once you’ve done this chain one. Skip the next chain and repeat. Continue this until you’ve reached the end of the row. Chain one and turn. You should be able to see the V stitches. 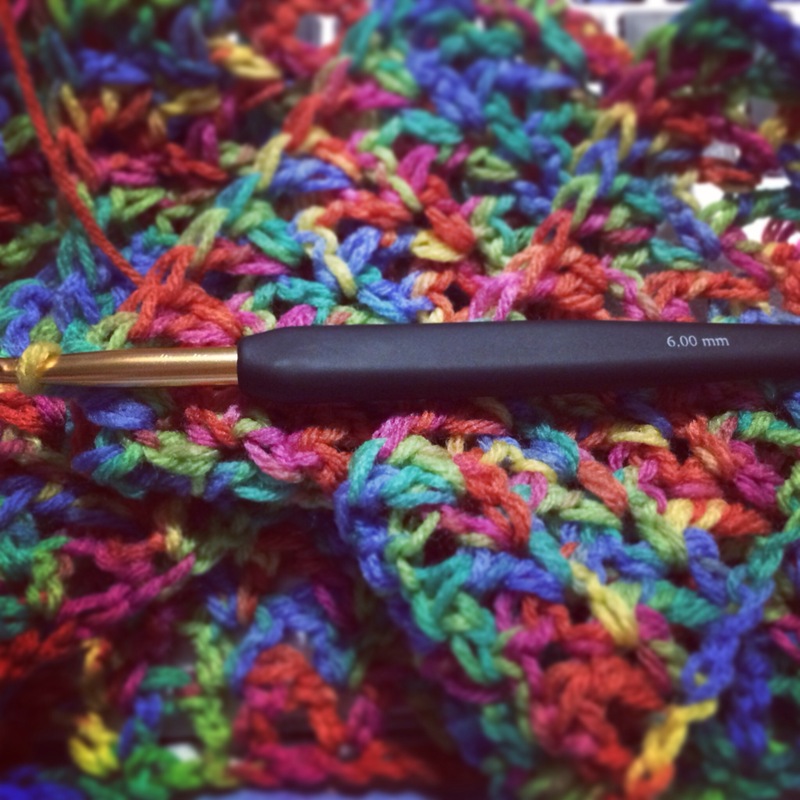 This is where you will now make your stitches. 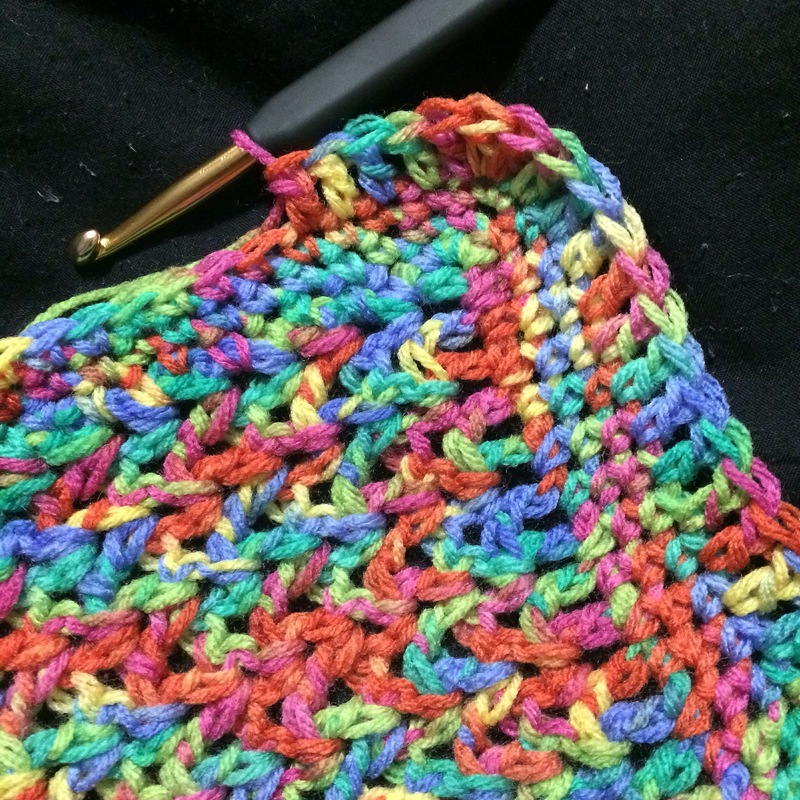 Repeat this pattern until you’re happy with the length and fasten off. 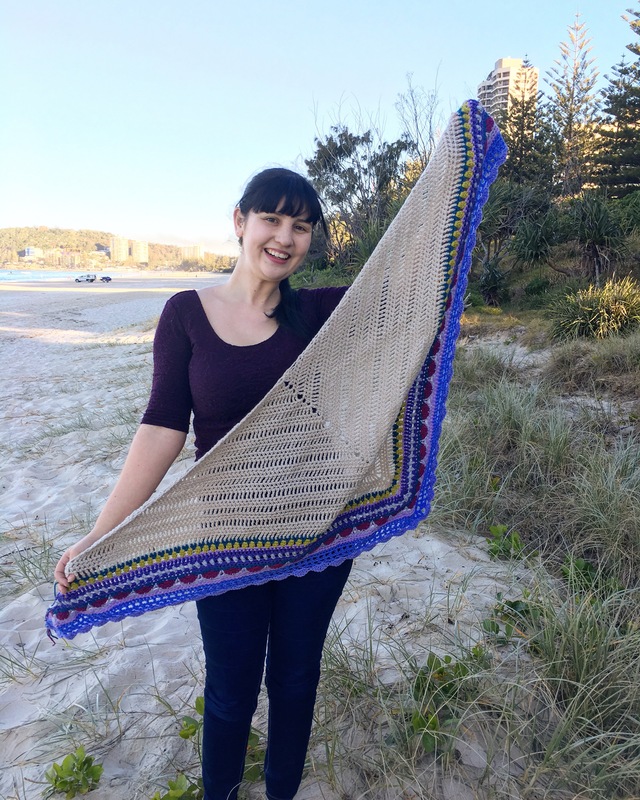 This is a great pattern to use up any scraps of yarn you have, or to use gradient yarn.